this marks the first of my christmas posts: and it's not even thanksgiving yet. normally i try to hold my christmas excitment at bay until at least black friday, but i just can't do it this year. thankfully, there is good reason. i recently stumbled across a great blog, it's hard to find a friend, written primarily by caleb palma. and somehow i noticed that he had a holiday album for sale for $7.50 the proceeds of which are donated to charity. only volume 1 was available when i visited the blog the first time, but now both volumes are out. "peace on earth started as a simple idea to have some musicians that i have the pleasure of calling friends record some christmas songs to raise money for toys for tots so some less fortunate tykes would not wake up to an empty living room on christmas morning 2007. the project grew to an 18-track collection of freshly penned originals, covers of holiday classics, and a few previously unavailable tracks, all recorded or released exclusively for the project. with a track listing which included chris walla (death cab for cutie), great lake swimmers, the long winters, rosie thomas, via audio, someone still loves you boris yeltsin, & 13 more, the project was a huge success. 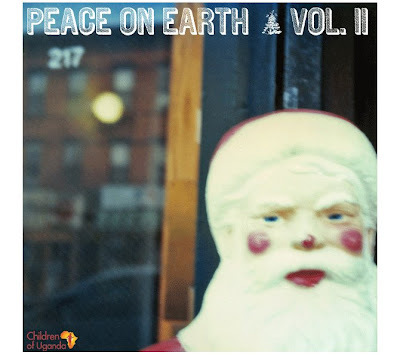 peace on earth was featured by countless webzines and blogs and prominent media outlets such as npr music & pitchfork media, and to date has raised more than $3,200.00 for toys for tots"
i don't know if you know this about me, but i'm the hugest sucker for a holiday cd. i'm constantly looking for good covers to mix in with the old classics, and this mix does just that. plus your $7.50 goes to a great cause; this year's proceeds will benefit the children of uganda fund. i obviously bought volumes 1 and 2. but since i assume you might not be as huge a christmas nerd as i am, i'm asking you to at least check this out and possibly get at least one of these. you can purchase this year's album here.